This construction video briefly explains the column reinforcement in detail. 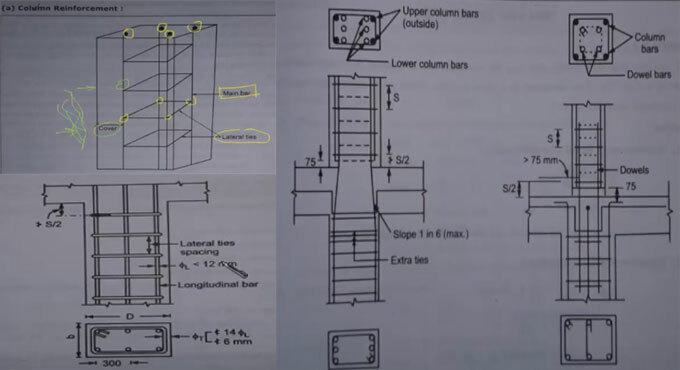 The video focuses on short column, long column or slender column, lateral ties, main bar, longitudinal bar, slope and spacing of column, end column etc. A reinforced concrete column refers to a structural member that can carry compressive loads. It is formed with concrete through an implanted steel frame to deliver reinforcement. For design purposes, the columns are segregated into two categories: short columns and slender columns. Normally, concrete columns comprise of square, rectangular or circular cross sectional area. Columns are basically needed with the primary longitudinal reinforcement and lateral ties to get rid of buckling of the main bars. Generally, columns bear bending moment respecting one or both axes of the cross section. The bending action may generate tensile forces across a portion of cross section. Reinforcement is useful to minimize the column size. The primary reinforcement in column is longitudinal that is parallel to the direction of load and includes bars organized in square, rectangular or circular shape. Gapping in longitudinal bars should not be in excess of 300 mm from the periphery of the column. In concrete columns, vertical reinforcement is the main reinforcement. Though, a loaded column abridges vertically and enlarges laterally; therefore, lateral reinforcements in the form of lateral ties are employed to check the enlargement. Columns reinforced in this way are defined as tied columns. If the restraining reinforcement belongs to a continuous winding spiral that encloses the core and longitudinal steel, the column is known a spiral column.